Gefördert durch die ¬¬Initiative Musik gemeinnützige Projektgesellschaft mbH mit Projektmitteln des Beauftragten der Bundesregierung für Kultur und Medien auf Grund eines Beschlusses des Deutschen Bundestages. The DJ Gregor Welz is presenting with FLATFISH his definition of house music at the coast side with a pinch of humor. 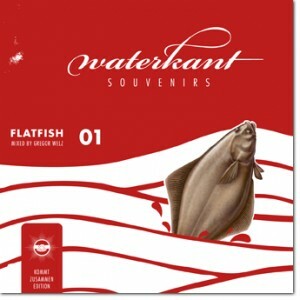 As the founder of WATERKANT SOUVENIRS he is going to start a new set of Mix-CD`s. Besides the songs of of Markus Meinhardt, Timid Boy, Julien Bracht and Dürerstuben; FLATFISH-Mix is mainly formed by music from the north. With the FLATFISH-Mix Artists like Andre Kronert, H.O.S.H., Kollektiv Ost, Daniel Nitsch and Soukie&Windish come to the fore. WATERKANT-SOUVENIRS is supported by the KOMMT-ZUSAMMEN – Festival. Accordingly the CD will be released as a KOMMT-ZUSAMMEN-Edition with 3000°-Records.